Following a busy week I've managed to post two new abstract oil paintings on my website http://simonkenny.artweb.com . Both paintings, The Fallen and End of Days, are available for viewing by clicking on my gallery tab . The Fallen is painted on a large 40" x 40" canvas, End of Days on a long 72" x 24" canvas and both were created using a similar colour palette of predominantly yellow and gold ochre, raw sienna, burnt sienna, raw umber, brown madder and paynes grey. Images and details of the two abstracts are below and should you be interested in seeing more of my work or are looking to make a purchase please go to my web address above. 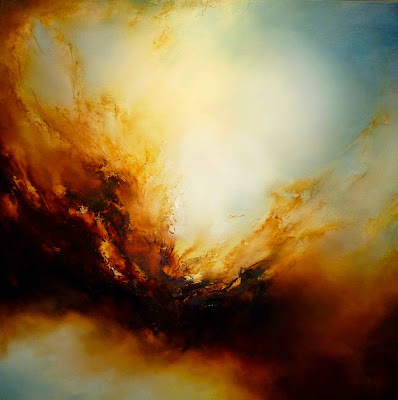 ﻿The Fallen, oil on canvas 40 x 40"
The End of Days, oil on canvas, 72 x 24"
Commissions are also welcome, if you have specific requirements or have seen a painitng you like but want it in an alternative size or colour please contact me at simonkenny@eskayfineart.co.uk . COMMISSION DETAILS: For all commissions undertaken a 50% advance deposit is required. Throughout the process I keep in contact with the client updating them as I progress with the work. Once I feel the painting/s are finished I take a number of high res photos, email the client with the images then upon approval I'll invoice for the outstanding balance to be paid and book the delivery. Commission quotes include all material costs and shipping as well as a two hour editing slot outside the agreed time frame allowing for minor alterations so there are no unseen costs. Lead times average 2-3 weeks including delivery dependent on requirements and location. Discounts on commission rates of 10% are available for orders of three paintings and 15% on four or more.